When this search was started in 2005, we were concentrating on what we thought was our earliest known ancestor - Rabbi Leopold STEIN of Frankfurt. Good fortune led us to a unique document - the so called Adelsdorf "Judenmatrikel" of 1822 which listed Leopold, but also opened our eyes to his parents and his siblings. As time progressed we succeeded in locating descendants of Rabbi Abraham Loeb SULZDORFER-STEIN, and hope eventually to be able to document all his descendants and record the history of these families. We have learned a great deal about the descendants of his daughters Nannette and Udilla. Anna's descendants are yet to be discovered in the USA. Many of Jacob's descendants have died, though there is one branch with which we have not yet managed to establish contact. We have collected most information about Leopold. Rabbi Leopold STEIN was revered by his daughter Bettina and his granddaughter Bettina Machol (nee Stein). They did much to promote his memory, and Bettina Machol donated the documents she possessed to the Leo Baeck Institute in New York. Thanks to the Internet we have today the power to reassemble much of his family - and thus discovered numerous other individuals who, likewise, strove - or still strive - to keep alive the life and work of this remarkable man. It is sad to learn how often one part of the family has no idea about the existence of another. The separation and estrangement started already in the 1800's. There was anti-Jewish legislation in force in Germany restricting their rights already then, laws which directly contributed to the mass migration mainly to the USA. It goes without saying that the events of World War 2 further contributed to the dispersal of the family. We have organised a Reunion of these families, which will be held at a location significant to the life of our ancestors. 2010 will be the 200th anniversary of the birth of Rabbi Leopold STEIN - is that not a good date for a family reunion? We met from Sunday 13th June 2010 in Franconia, Bavaria, Germany - and toured the area in which our ancestors were born and lived. 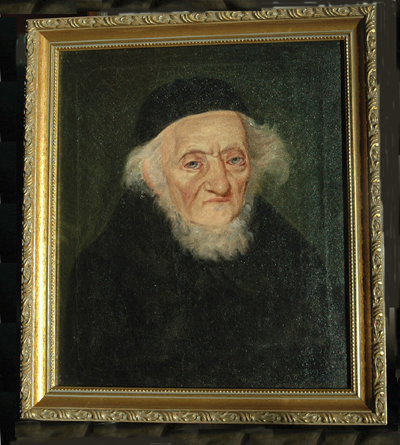 Rabbi Leopold Stein was born in the year 1810. This prompted the organization of a reunion of his descendants in Franconia, Bavaria, Germany to commemorate him, on his 200th birthday, and to allow the widely dispersed family members to meet, many for the first time. David and Sylvia Lewin were the main organizers, and did a fantastic job of arranging meetings with mayors, museum curators, historians, and the press. The major work was done in the previous few years when David painstakingly put together a family tree, and contacted as many of the surviving members as he could. (He also has prepared an amazing website with a huge amount of information about family members.) 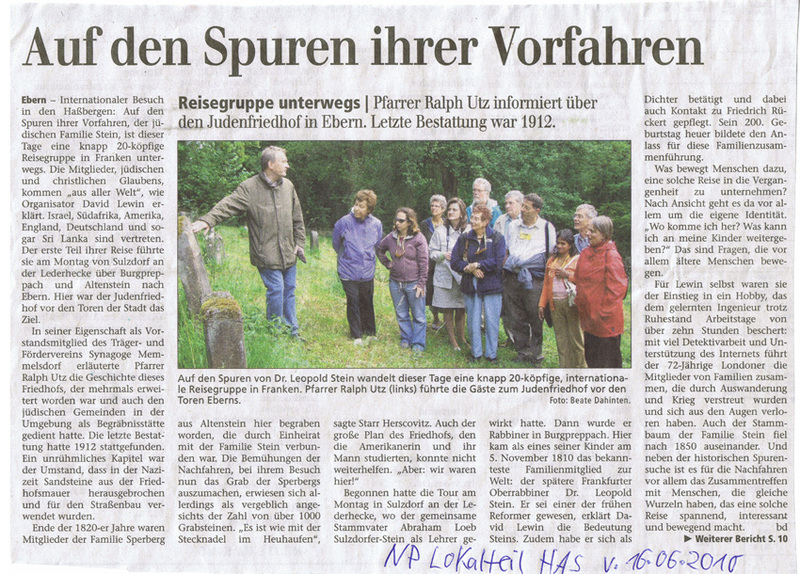 The result was a gathering of 21 family members from Great Britain, the United States, South Africa, Israel and Germany in the 300-year-old Drei Kronen hotel in Adelsdorf, the town where Abraham Loeb Stein, the father of Leopold and the common ancestor of the participants, lived. The family tree, as completed at the time of the meeting, was printed out as a 10-meter scroll which was pasted around the walls of our meeting room. Although most of us did not know each other before this gathering, there was an immediate rapport, perhaps because we knew we were related, even though in many cases rather distantly. Each participant was given a color-coded name-tag, depending on whether the greatgreatgrandfather was Leopold Stein, Adelheid Stein Sporberg or Jacob Stein Brandis. A bus had been organized which took us to the various villages associated with the family. Each day we made an excursion in a different direction – north, east, west or south – and were given excellent tours by the local historian or museum director. Our first stop was Sulzdorf, where Abraham Loeb Stein was born (in fact, he originally took the name Sulzdorfer, but later changed it to Stein). Here he married Saine Hirsch, and many of his children were born here. We were welcomed by the mayor of Sulzdorf, then given a tour by Reinhold Albert, who is very knowledgeable about the Jews of the region and wrote a book about them 10-15 years ago, which he plans to update. We visited the town and the local cemetery. Our next and longest stop was Burgpreppach, where Leopold Stein was born. Here we were greeted at her castle by the Baroness Deuster Fuchs von Bimbach und Dornheim with a champagne reception, and welcomed by the local mayor. The press was present and an article about the group appeared in the local paper. The baroness explained the importance of the so-called “Schutzjuden”, who paid a tax to the local baron, then had the freedom to live anywhere in the town. She commented how the Jews had helped convert the town from a sleepy bishop's see to a thriving town because of their intelligence and initiative in commerce, banking and other activities. It was only when most of the Jews left the town around 1890 that the local citizens appreciated what their role had been. We were given a tour of the castle, and shown the archives, which have a wealth of material, mostly written in Gothic script, a mine of information which hopefully will be deciphered and published one day. We were featured in the local press! After lunch at the Gasthof Burgblick in Manau we returned to Burgpreppach to visit the museum which several ladies in the town, led by Heidi Flachsenberger and Gerda Wenzlow, and ably helped by Silke Schmitt, have lovingly set up, with several panels about Leopold Stein and the Reform Jewish movement. There are also other exhibits of the local flora and fauna. Hugo and Gisela Dittmann had not returned to their home in America, having waited for us for 5 weeks, so that they could meet us and we could thank Hugo for his tireless efforts in transliterating dozens of letters sent in the 19th century by various members of the family. We then drove to Altenstein, the town where Leopold's sister Adelheid/Udila Stein married Wolf Samson Sperberg, and where the eight Sperberg children were born. This was of particular interest to her descendants, who tried to find the actual house in which the family lived – unfortunately, as so often, the house numbers had been changed. The town had a ruined castle, well preserved, which was picturesquely perched on a hill. The next stop was the cemetery in Ebern, where the Sperberg family are buried, and here we were guided by the Reverend Ralph Utz. (see report in the local newspaper) Over all we visited Jewish cemeteries in several towns and were pleasantly surprised that they were fairly well kept, with warning signs that vandalism is severely punishable. What a full day! But at dinner afterwards we were still very upbeat, discussing our experiences and becoming better acquainted with each other. The Main Post published a report about the visit. Today we visited the charming town of Bamberg. We first visited the new modern synagogue and had an excellent tour by Elena Goldbaum. We were shown the mikveh (ritual bath which must be used by women before marriage, and monthly 7 days after their menstrual period ends, before they can sleep with their husbands). Also we were shown the ark with the torahs. There is a small but active Jewish population, and women are allowed to help make up the minyan (minimum of 10 people needed before a service can be held). We were also shown the synagogue memorial on Synagogenplatz, where the old synagogue had stood, and which was destroyed, like most other synagogues in Germany, on Kristallnacht (November 9th 1938). We then toured the old quarter of this delightful town, and had lunch at the Hotel Alt Ringlein. We then returned to Adelsdorf, where we had a tour of the town, and were shown the Shoah (Holocaust) memorial, the palace (next door to our hotel) where the Schutzjuden paid their dues, and the local agriculture museum. Then we had a fascinating illustrated lecture by Johann Fleishmann, who heads the Mesusah organization. He has made a detailed study of Jewish history in Franconia and has published a book each year on this topic, handling different aspects. He showed us copies of highly interesting letters from Rabbi Abraham Loeb Stein, written in Yiddish using Hebrew characters, requesting an increase in his salary, as well as his entry for the Judenmatrikel (a permit for Jews to live in a particular locality). In the evening Doris Balinsky spoke about Leopold's eldest son, Sigismund Theodor Stein, a renowned physician and physicist. She was followed by Mary Lou Michael whe read a letter from her great grandfather Louis reporting how he had found his lost brother Isaac. Today the bus took us to Redwitz, where the Freunds lived. Rainer Domke, an authority on Leopold Stein and his family, gave us a tour of Redwitz, as well as Kueps, where we visited the ancient mikveh, now in a private home but still well-preserved. Then we visited Mitwitz, where Elenore Wertheimer was born, and the Freunds lived. We were welcomed in the city hall by the mayor, Hans Peter Laschka, who had prepared a “golden book” which we all signed. He and Rainer then accompanied us on a tour of the charming town, and joined us for lunch at “Zum Steinernen Loewen”, formerly the house of Salomon Wertheimer, an uncle of Elenore's. We also saw the house where Elenore was born. Ingrid and Peter Steinhaeusser were delighted to accompany us and act as translators. In the late afternoon we went to Burgkunstadt, where Leopold and Elenore's first five children were born and where Leopold had his first synagogue (he was 25 years old when he first moved there). We also visited nearby Altenkunstadt, his alternative synagogue, which still stands, and is now a community center and museum. Our guide was Joseph Motschmann and Inge served as the translator. In the evening Shula Levital and Starr Herscovitch spoke about their ancestors. We were very sorry that the oldest of our family members, Lotte TREVES, could not join us. She felt that at 97 she should not be travelling from Rome. She has sent us a letter with family background which you can read here. Our final day took us to Fuerth, the town where Abraham Loeb Stein had served as rabbi. We had an excellent tour of the modern and very well laid out Jewish museum, by the American-born director, Daniela Eisenstein. After lunch at the Gasthaus Schwarzes Kreuz, we wandered through the charming old town, before returning to Adelsdorf for our final evening of memoirs, this time by Thomas Georgi. This was an exciting and inspiring gathering. Most of the German participants had not known that they had Jewish ancestry until David contacted them, and they found the experience interesting, Despite language differences, the German- and English-speaking contingents managed to communicate well (mainly the Germans spoke pretty good English). Also, the German speeches by the various officials were translated efficiently by David (and occasionally by Doris) into English for the benefit of the non-German-speaking relatives. Everybody was most grateful to David and Sylvia for having done the footwork and for having coordinated this gathering, new friendships were made, photos have been exchanged since then, and we hope that we will manage to keep in contact with our new relations! I’m working on writing my memories of the reunion, as you asked, before events fade, because then I’ll have to wait until Alzheimer’s kicks in to relive it. Simply though, the reunion was an experience that I did my best to absorb, and only wish I could experience it about 5 more times to get the most out of every speaker and place that you both and Starr and Rainer planned. As each day developed, I was sure it could not be as interesting as the day before, and yet each day was even better. Every researcher added color to my understanding of life for a Jew in the 1800s and before WWII. Then the stories that were shared touched my heart. Everyone has a story and having the time after dinner to hear them in a relaxed setting connected us to each other in ways I will never forget. There should have been a video camera rolling. Walking in the same locations as my ancestors is a dream I have had since my teens when I asked my grandfather where our family had come from. I studied German in high school as part of the connection I knew about, but my grandfather thought we came from near Schweinfurt, and I wondered at the odd name for a Jewish family’s hometown. When I lived in Germany for two years, I looked in every telephone book for family members, but never found one. Now I know the reason - that they changed the family name in America. With the suffix –borg, I thought there must have been a Swedish connection, so I also searched maps of Sweden for a Spor Borg. Northing was there! Curiosity is a potent motivator, but without the internet I would have gotten no further. Thanks to wonderful Starr for getting in contact with me shortly after I joined Ancestry.com on my father’s birthday, people are emerging out of the mist of time, and I am ever so grateful. It is intended to brig to the site a selection of the photographs which were taken during the reunion trip.